The 5th Beachfield Summer Open L3 will take place at Medway Pk on Saturday 6th July 2019. The pool has been booked and a licence has been granted 3SE191620. First Come First Served - Enter ASAP. We are now open for entries. This meet is now full. Accepted Entries will be posted here shortly. Apologies but no further entries will be accepted. 5th BSS Summer Open 6th July L3 2019 word document for typing in to. Hytek entry file -To be used in conjunction with Team Manager or TM Lite which is available to download free from the Hytek website. 4th Beachfield Summer Open Results 7.7.18 - well done all. Congratulations to Maidstone SC who retained the top team trophy at the 3rd Beachfield Summer Open - great swimming! 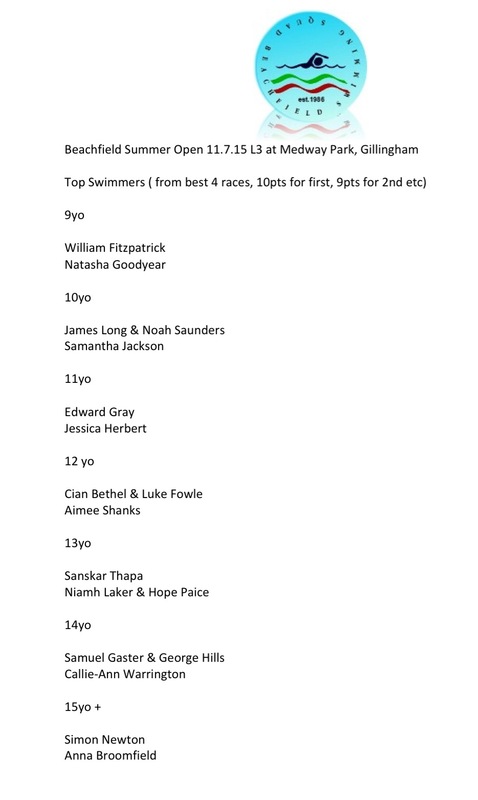 Cash Prize and Certificate Winners "Top Swimmer"
Results by team - an asterisk means that the entry time was beaten! Well done to Maidstone SC for winning the top team trophy! Points shown using the 10,9,8 system not the 20,17,16 system!